"Quorra" redirects here. For the Tron: Legacy character, see List of Tron characters § Quorra. This article is about the river. For the play, see The River Niger. The Niger River (/ˈnaɪdʒər/; French: (le) fleuve Niger, pronounced [(lə) flœv niʒɛʁ]) is the principal river of West Africa, extending about 4,180 km (2,600 mi). Its drainage basin is 2,117,700 km2 (817,600 sq mi) in area. Its source is in the Guinea Highlands in southeastern Guinea. It runs in a crescent through Mali, Niger, on the border with Benin and then through Nigeria, discharging through a massive delta, known as the Niger Delta or the Oil Rivers, into the Gulf of Guinea in the Atlantic Ocean. The Niger is the third-longest river in Africa, exceeded only by the Nile and the Congo River (also known as the Zaïre River). Its main tributary is the Benue River. Manding: Jeliba or Joliba "great river"
Igbo: Orimiri or Orimili "great water"
Tuareg: Egerew n-Igerewen "river of rivers"
Ijaw: Toru Beni "the river water"
Zarma: Isa Beeri "great river"
The earliest use of the name "Niger" for the river is by Leo Africanus in his Della descrittione dell’Africa et delle cose notabili che iui sono published in Italian in 1550. The name may come from Berber phrase ger-n-ger meaning "river of rivers". As Timbuktu was the southern end of the principal Trans-Saharan trade route to the western Mediterranean, it was the source of most European knowledge of the region. Medieval European maps applied the name Niger to the middle reaches of the river, in modern Mali, but Quorra (Kworra) to the lower reaches in modern Nigeria, as these were not recognized at the time as being the same river. When European colonial powers began to send ships along the west coast of Africa in the 16th and 17th centuries, the Senegal River was often postulated to be the seaward end of the Niger. The Niger Delta, pouring into the Atlantic through mangrove swamps and thousands of distributaries along more than 160 kilometres (100 miles), was thought to be no more than coastal wetlands. It was only with the 18th-century visits of Mungo Park, who travelled down the Niger River and visited the great Sahelian empires of his day, that Europeans correctly identified the course of the Niger and extended the name to its entire course. The modern nations of Nigeria and Niger take their names from the river, marking contesting national claims by colonial powers of the "Upper", "Lower" and "Middle" Niger river basin during the Scramble for Africa at the end of the 19th century. The Niger River is a relatively "clear" river, carrying only a tenth as much sediment as the Nile because the Niger's headwaters lie in ancient rocks that provide little silt. Like the Nile, the Niger floods yearly; this begins in September, peaks in November, and finishes by May. An unusual feature of the river is the Inner Niger Delta, which forms where its gradient suddenly decreases. The result is a region of braided streams, marshes, and lakes the size of Belgium; the seasonal floods make the Delta extremely productive for both fishing and agriculture. The river loses nearly two-thirds of its potential flow in the Inner Delta between Ségou and Timbuktu to seepage and evaporation. All the water from the Bani River, which flows into the Delta at Mopti, does not compensate for the 'losses'. The average 'loss' is estimated at 31 km3/year, but varies considerably between years. The river is then joined by various tributaries, but also loses more water to evaporation. The quantity of water entering Nigeria measured in Yola was estimated at 25 km3/year before the 1980s and at 13.5 km3/year during the 1980s. The most important tributary of the Niger in Nigeria is the Benue River which merges with the river at Lokoja in Nigeria. The total volume of tributaries in Nigeria is six times higher than the inflow into Nigeria, with a flow near the mouth of the river standing at 177.0 km3/year before the 1980s and 147.3 km3/year during the 1980s. The Niger takes one of the most unusual routes of any major river, a boomerang shape that baffled geographers for two centuries. Its source is just 240 km (150 mi) inland from the Atlantic Ocean, but the river runs directly away from the sea into the Sahara Desert, then takes a sharp right turn near the ancient city of Timbuktu (Tombouctou) and heads southeast to the Gulf of Guinea. This strange geography apparently came about because the Niger River is two ancient rivers joined together. The upper Niger, from the source west of Timbuktu to the bend in the current river near Timbuktu, once emptied into a now dry lake to the east northeast of Timbuktu, while the lower Niger started to the south of Timbuktu and flowed south into the Gulf of Guinea. Over time upstream erosion by the lower Niger resulted in stream capture of the upper Niger by the lower Niger. 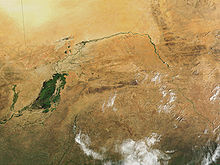 The northern part of the river, known as the Niger bend, is an important area because it is the major river and source of water in that part of the Sahara desert. This made it the focal point of trade across the western Sahara, and the centre of the Sahelian kingdoms of Mali and Gao. The surrounding Niger River Basin is one of the distinct physiographic sections of the Sudan province, which in turn is part of the larger African massive physiographic division. 1561 map of West Africa by Girolamo Ruscelli, from Italian translation of Ptolemy's Atlas "La Geograpfia Di Claudio Tolomeo Alessandrino, Nouvamente Tradatta Di Greco in Italiano". The writer was attempting to square information gleaned from Portuguese trade along the coast with Ptolemy's world map. The mouths of the Senegal River and Gambia River are postulated to flow into a lake, which also feeds the "Ger"/Niger River, which in turn feeds the "Nile Lake" and Nile River. The origin of the river's name remains unclear. What is clear is that "Niger" was an appellation applied in the Mediterranean world from at least the Classical era, when knowledge of the area by Europeans was slightly better than fable. A careful study of Classical writings on the interior of the Sahara begins with Ptolemy, who mentions two rivers in the desert: the "Gir" (Γειρ) and farther south, the "Nigir" (Νιγειρ). The first has been since identified as the Wadi Ghir on the north western edge of the Tuat, along the borders of modern Morocco and Algeria. This would likely have been as far as Ptolemy would have had consistent records. The Ni-Ger was likely speculation, although the name stuck as that of a river south of the Mediterranean's "known world". Suetonius reports Romans traveling to the "Ger", although in reporting any river's name derived from a Berber language, in which "gher" means "watercourse", confusion could easily arise. Pliny connected these two rivers as one long watercourse which flowed (via lakes and underground sections) into the Nile, a notion which persisted in the Arab and European worlds – and further added the Senegal River as the "Ger" – until the 19th century. The connection to the Nile River was made not simply because this was then known as the great river of "Aethiopia" (by which all lands south of the desert were called by Classical writers), but because the Nile flooded every summer. In Europe and Western Asia, floods are expected in the Spring, following snow melt. Classical authors explained the summer flood by calculating the time it took for flood waters to move down a river, and calculating how long the Nile must have been for the waters to travel from a mountain range in the spring. However the cycle of the Nile is influenced by tropical rain patterns instead of by melting snow, a characteristic unknown to the Classical Mediterranean world. Through the descriptions of Leo Africanus and even Ibn Battuta – despite his visit to the river – the myth connecting the Niger to the Nile persisted. While the true course of the Niger was presumably known to locals, it was a mystery to the outside world until the late 18th century. Ancient Romans such as Pliny (N.H. 5.10) thought that the river near Timbuktu was part of the Nile River, a belief also held by Ibn Battuta, while early European explorers thought that it flowed west and joined the Senegal River. Many European expeditions to plot the river were unsuccessful. In 1788 the African Association was formed in England to promote the exploration of Africa in the hopes of locating the Niger, and in June 1796 the Scottish explorer Mungo Park was the first European to lay eyes on the middle portion of the river since antiquity (and perhaps ever). The true course was established in his book Travels in the Interior of Africa, which appeared in 1799. The African Association failed in assaults from the north (Tripoli), the east (Cairo), and the west (Gambia). The membership now proposed that an effort be made from the south. The site chosen in 1804 from which to strike inland was a British trading post in the Gulf of Guinea. Unbeknownst to him, the river mouth that emptied into the Gulf, whence Henry Nicholls was to set out in search of the Niger, was precisely the end of the Niger itself—only the Europeans did not know it yet. The starting point of the expedition was in fact its destination. On October 24, 1946 three Frenchmen, Jean Sauvy, Pierre Ponty and movie maker Jean Rouch, former civil servants in the African French colonies, set out to travel the entire length of the river, as no one else seemed to have done previously. They travelled from the very beginning of the river near Kissidougou in Guinea, walking at first till a raft could be used, then changing to various local crafts as the river broadened and changed. Two of them reached the ocean on March 25, 1947, with Pierre Ponty having had to leave the expedition at Niamey, somewhat past the halfway mark. They carried a 16mm movie camera, the resulting footage giving Jean Rouch his first two ethnographic documentaries: "Au pays des mages noirs", and "La chasse à l’hippopotame". A camera was used to illustrate Jean Rouch's subsequent book "Le Niger En Pirogue" (Fernand Nathan, 1954), as well as Jean Sauvy's “Descente du Niger” (L'Harmattan 2001). A typewriter was brought as well, on which Pierre Ponty produced newspaper articles he mailed out whenever possible. More recently, Norwegian adventurer Helge Hjelland made another journey through the entire length of the Niger River starting in Guinea-Bissau in 2005. The trip was filmed by the adventurer himself and made into a documentary titled "The Cruellest Journey". The water in the Niger River basin is partially regulated through dams. In Mali the Sélingué Dam on the Sankarani River is mainly used for hydropower, but also permits irrigation. Two diversion dams, one at Sotuba just downstream of Bamako, and one at Markala, just downstream of Ségou, are used to irrigate about 54,000 hectares. In Nigeria the Kainji Dam and the Jebba dam are used to generate hydropower. The water resources of the Niger River are under pressure due to increased water abstraction for irrigation and due to the impact of climate change. The construction of dams for hydropower generation is underway or envisaged in order to alleviate chronic power shortages in the countries of the Niger basin. The FAO estimates the irrigation potential of all countries in the Niger river basin at 2.8 million hectares. Only 0.93m hectares (ha) were under irrigation in the late 1980s. The irrigation potential was estimated at 1.68m ha in Nigeria 0.56m ha in Mali, and the actual irrigated area was 0.67m ha and 0.19m ha. Most of the investments are funded or are expected to be funded through aid. For example, the Kandadji Dam is financed by the Islamic Development Bank, the African Development Bank and the OPEC Development Fund. The World Bank approved a US$500 million soft loan in July 2007 to finance projects in the basin over a 12-year period. Funding will be awarded in two phases. The initial $185 million credit will go to Nigeria, Guinea, Benin, Mali and Niger. The second, $315 million investment, is slated for Burkina Faso, Cameroon, Chad and Ivory Coast. Besides financing the rehabilitation of dams in Nigeria, the loan will also fund the "sustainable management of selected degraded ecosystems and rehabilitation of small water infrastructure" and capacity building. In September 2009, the Nigerian government commenced a 36 billion naira dredging of the Niger River from Baro to Warri, a move which will see silt removed from several hundred kilometres. The dredging is intended to make it easier for goods to be transported to isolated settlements located deep within from the Atlantic Ocean. Estimated to be completed within six to eight months, it had first been proposed and then postponed for 43 years previously by the then government. Speaking in Lokoja, Nigerian President Umaru Yar'Adua stated that the project would lead to "all-year-round navigability" on the River Niger and that he hoped that, by 2020, Nigeria would have become one of the twenty most industrialised nations in the world. Alhaji Ibrahim Bio, the Nigerian Minister of Transport, said his ministry would work to make certain the project would be completed within its designated timeframe. Some activists have, however, opposed the project in the past, claiming it may have negative effects on waterside villagers. In late March 2010 the dredging project was 50% complete. Azawagh - dry basin that once carried a northern tributary of the Niger River. ^ Niger Basin Authority (NBA), Executive Secretariat, "8th Summit of the Heads of State and Government", Final communique , quoted in the Newsletter No. 47 of ECLAC because the website of the Niger Basin Authority is not working. ^ "WWD Continents". www.geol.lsu.edu. Archived from the original on 8 October 2017. Retrieved 28 April 2018. ^ Castano, Ing. Antonio. "A STUDY ON THE HYDROLOGICAL SERIES OF THE NIGER RIVER AT KOULIKORO, NIAMEY AND LOKOJA STATIONS". webcache.googleusercontent.com. Retrieved 28 April 2018. ^ Hunwick, John O. (2003) . Timbuktu and the Songhay Empire: Al-Sadi's Tarikh al-Sudan down to 1613 and other contemporary documents. Leiden: Brill. p. 275 Fn 22. ISBN 978-90-04-11207-0. ^ a b c Reader 2001, p. 191. ^ Reader 2001, pp. 191–192. ^ Tom L. McKnight; Darrel Hess (2005). "16, "The Fluvial Processes"". Physical Geography: A Landscape Appreciation (8th ed.). Upper Saddle River, New Jersey: Pearson, Prentice Hall. p. 462. ISBN 978-0-13-145139-1. ^ Geographia, Book IV, Chapter 6, Section 13. ^ Law, R. C. C. (1967), "The Garamantes and Trans-Saharan Enterprise in Classical Times", The Journal of African History, 8 (2): 181–200, doi:10.1017/S0021853700007015 . Law carefully ties together the classical sources on this, and explains the mix of third hand reports and mythology that was current in both the European and Arab worlds. ^ Thomson 1948, pp. 258–259. ^ Thomson 1948, p. 258. ^ Frank T. Kryza, The Race for Timbuktu: In Search of Africa’s City of Gold, New York: HarperCollins, 2006, p. 46. ISBN 0060560657. ^ "In the Niger Basin, Countries Collaborate on Hydropower, Irrigation and Improved Water Resource Management". World Bank. Archived from the original on 2017-09-20. Retrieved 2017-09-20. ^ a b c d e "Nigeria begins vast river dredge". BBC. 2009-09-10. Archived from the original on 2009-09-13. Retrieved 2009-09-11. Fabio Spadi, "The ICJ Judgment in the Benin-Niger Border Dispute: the interplay of titles and ‘effectivités’ under the uti possidetis juris principle", Leiden Journal of International Law https://openaccess.leidenuniv.nl/handle/1887/13541(2005) 4, pp. 777–794. This page was last edited on 14 April 2019, at 15:06 (UTC).